Mason Quayle desperately wishes he could have a different sort of life. Being a bard in a little town where nothing happens is, to put it mildly, dull and not very profitable. Writing lyrical songs about how a man stood up to a chipmunk just is not exactly inspiring. Ten years or so ago Mason’s town, Darlington, used to be a very different place with heroes living in Hero’s Alley and adventures of all kinds happening regularly. Back then Mason’s father was around and life for Mason and his mother was happy. Then the local duke took on the job of being a hero and the rest of the heroes in town packed their bags and left. Now the Duke is the only hero in town and he is squeezing the people for taxes regularly, taxes which keep them poor and unhappy. He says the taxes pay for their protection but no one really understands how this works. Not until Mason and his friend Cowel discover that the duke is not a hero at all. All this time he has been using the so-called taxes to pay off the orcs, trolls, goblins, and other creatures which could be a threat to Darlington. He has not been fighting them at all and he is quite simply, a coward and a fraud. Now the duke is in real trouble because he has finally run out of money. He can no longer pay off the town’s enemies and he certainly cannot fight them. Worse still there are no heroes left in town to defend it. They only have five days before the leader of the orcs comes to the town looking for twenty thousand in gold and when he doesn’t find it – which he won’t – he and his minions will destroy the town for good. Attracted by the idea of a quest, Mason agrees to go off to find some heroes for their cause. If he can find and bring back a handful of heroes the town might have a chance. 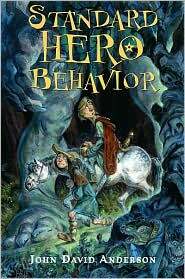 As they travel he and Cowel read from Mason’s father’s book Quayle’s Guide to Adventures for the Unadventurous and they learn what Standard Hero Behavior is. After reading a fair bit into the book neither young man holds out any hopes that he will ever be able to be a hero. It would appear that being a hero is not as easy as it looks. Together Cowel and Mason face all kinds of difficulties and they have a terrible time trying to track down any heroes at all. All they do find is the young daughter of two ex heroes and a narcoleptic swordsman who fights best when he is asleep. Is their town doomed after all? In this thoroughly amusing book readers watch as a very unlikely young man is forced into a hero’s role, a role which he is, alas, ill suited for. As he and his friend bumble about just managing not to get killed, they learn a great deal about themselves and the past. Mason learns who his father was and that though he was not a hero in the traditional sense, he was nevertheless a hero and someone to be proud of. Full of quirky characters and unexpected revelations, this is a story which will not only make readers laugh but it will also give them cause to think. Perhaps being glamorous is not all it’s cracked up to be. Perhaps doing what you are good at and what you love is enough after all.